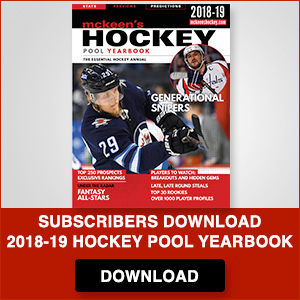 Founded in 1994, McKeen’s Hockey is a recognized expert at both the NHL and prospect level through its leading publications, McKeen’s Hockey Pool Yearbook and McKeen’s NHL Draft Guide. The team at McKeen’s has been profiling the top prospects and future NHL stars for more than 20 years. McKeen's has built up a strong network of contacts, combined with scouting both in rinks and on video, to produce a respected NHL Draft resource. Hockey insiders and draft enthusiasts trust McKeen’s reporting to provide valuable perspective on a players potential. Our flagship publication publishing celebrating its 22nd anniversary. It provides a complete breakdown of each NHL team and the fantasy potential of its players. It contains articles by leading hockey writers, the top 475 player projections, the top 150 NHL Prospects, and much more. Published each year prior to the NHL Draft it provides a thorough overview of the coming NHL Draft. Our website features all of the content of our publications plus many more player profiles and articles than is possible in our print editions. It is an enormous hockey resource covering thousands of players. Smart Phone enabled app to make it easier to search and access information on your phone.